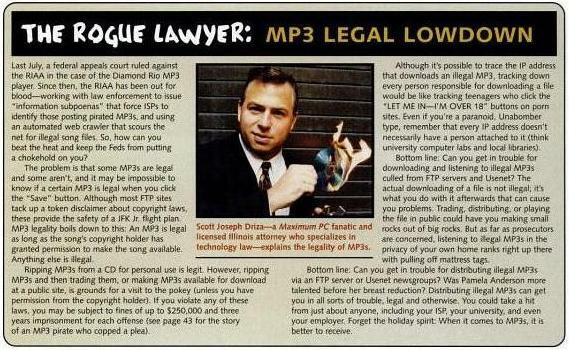 This article appeared in the February 2000 issue of MaximumPC Magazine. This book focuses on innovative ways to create customized Word documents and templates. It contains an in-depth introduction to VBA (Visual Basic for Applications), which is the embedded programming language in the Microsoft Office 2007. VBA provides a complete integrated development environment (IDE) that allows for document automation, the process of using an automated template for creating documents. 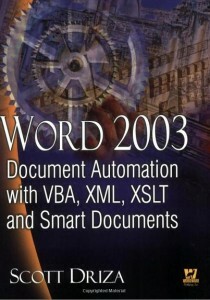 The book also includes coverage of the new features of Word 2007 including Content Controls, programming the Ribbon, and more. While it has always been possible to create customized Word solutions, Word 2003 offers new functionality that allows documents to be truly interactive. 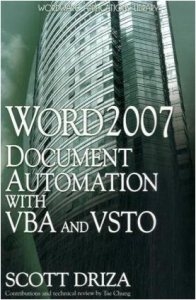 Word 2003 Document Automation with VBA, XML, XSLT, and Smart Documents explains how to use a variety of technologies that change the ways users interact with documents. Scott Driza discovered the power of document automation early in his career as an attorney for Merrill Lynch. Since then he has created document automation solutions for organizations throughout the world. In addition, he has written several articles on Word document automation, is the author of Learn Word 2000 VBA Document Automation, and has spoken at Microsoft conferences on Microsoft Word. He has degrees in finance, law, and computer science. VBA (Visual Basic for Applications) is the embedded programming language in the Microsoft Office 2000 suite of applications. VBA provides a complete integrated development environment (IDE) that allows for document automation, the process of using an automated template for creating documents. 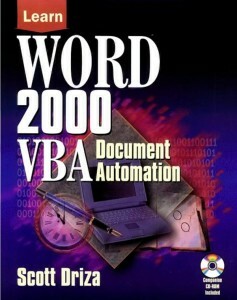 Learn Word 2000 VBA Document Automation is for those advanced users of Word 2000 who are looking to automate the task of preparing documents and programmers who are unfamiliar with document automation and the Word object model. Among the topics covered are recording macros, creating automated templates, formatting and manipulating files using Word, and building documents dynamically.